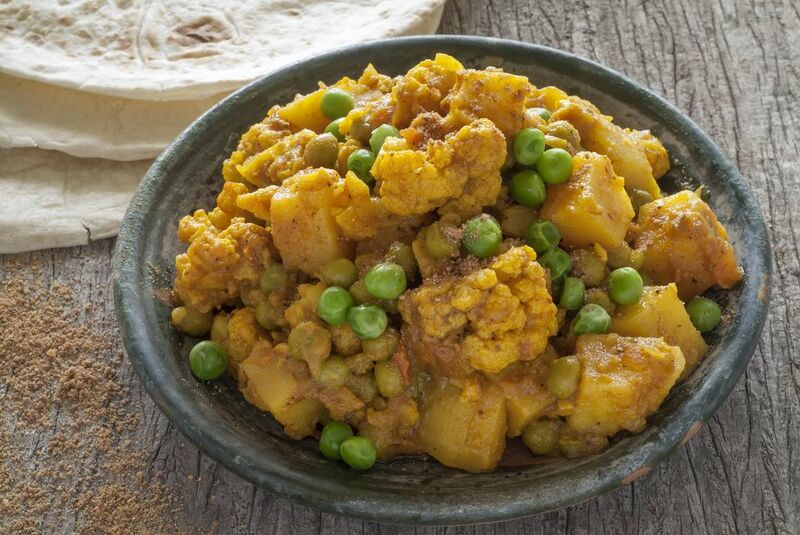 The combination of Indian spices transforms this simple vegetable dish into a delight for the senses. This authentic Indian curry recipe is both vegetarian and vegan, and gluten-free, too. The dish combines curry with cayenne and cumin and has a spicy kick. The word curry is believed to come from the Tamil word kari, which means "sauce" in the South-Indian language. Curry dishes have a history that is thousands of years old, and there is no real consensus about what a true curry dish is, as the term is used to identify countless spicy stew-like dishes from India, the South Pacific, and the Caribbean. You could say that curry is a bit of smorgasbord, combining spices from Indian, Muslim, Southeast Asian and Portuguese cooking, meaning it's not a truly Indian dish as many Westerners now think of it. However, it's possible that original curry predates the age of trade between Arab, Chinese, Indian and European traders; researchers have found that the Indus people ate dishes containing ginger, garlic, and turmeric as far back as 4,500 years ago. Whatever the origins of curry are, you can enjoy it from the comfort of your home wherever you live. This vegan Indian cauliflower curry recipe is easy to prep in 10 minutes or less and will create a fragrant and irresistible scent in your home as it simmers on the stove. Got some extra cauliflower after making this recipe? Turn it into a quick side dish of vegetable pakoras and make yourself a complete Indian feast! In a blender or food processor, grind together the ginger, sesame seeds, peanuts, garlic, spices, and water. Sautee the onions in vegetable oil in a pan over medium-high heat, about three to five minutes, or until onions turn clear. Add cauliflower and spices mixture to the pan and cover. Allow it to cook another 10 to 12 minutes, occasionally stirring until cauliflower is almost fully cooked. Add lemon juice and allow to cook for 3 more minutes. Enjoy as a side dish or pair with Indian naan for a warming and nourishing meal.